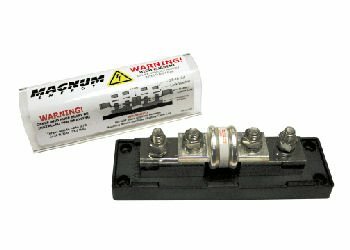 The Magnum Energy Class-T Fuse/Fuse Block is designed to provide code compliant overcurrent protection. It protects the battery bank, inverter, and cables from damage caused by short circuits and overloads. A fast acting, current-limiting Class-T fuse cartridge delivers instantaneous protection in the event of a short circuit, as well as a time delay to allow the momentary current surges that are common in inverter applications. A rugged injection-molded polycarbonate base and thermoformed ABS cover provide durability, easy installation, and good looks in a compact, cost effective package. Fuse selection is based upon the size of the conductor between the battery and the load. Keep in mind that the conductor's current carrying capability is affected by: the length of the cable between the battery and the load, and the conductor's wire type and temperature rating. If you have any questions about this product by Magnum Energy, contact us by completing and submitting the form below. If you are looking for a specif part number, please include it with your message.